In this article, four two-handed swords, 14 one-handed swords, one dagger and one rapier blade from the MAM (Martial Arts Museum) in Botticino – the Roberto Gotti collection, are presented with text, images and detailed measurements. The examined weapons range from the 15th to the 17th century. A precise reconstruction of the blades is made possible with the included measurements. Furthermore, various measured parameters indicate handling characteristics. 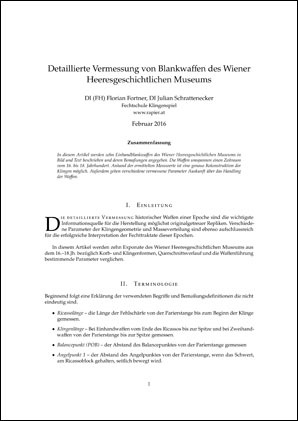 In this article, 10 one-handed swords from the “Wiener Heeresgeschichtliches Museum (HGM)” are presented with text, images and detailed measurements. The examined weapons range from the 16th to 18th century. A precise reconstruction of the blades is made possible with the included measurements. Furthermore, various measured parameters indicate handling characteristics. 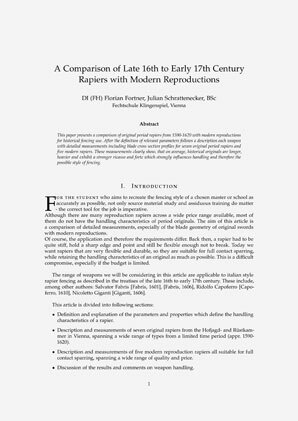 This paper presents a comparison of original period rapiers from 1590-1620 with modern reproductions for historical fencing use. 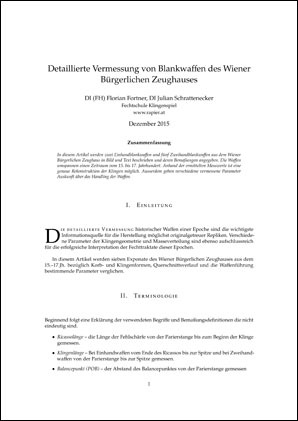 After the definition of relevant parameters follows a description of each weapon with detailed measurements including blade cross section profiles for seven original period rapiers and five modern rapiers. 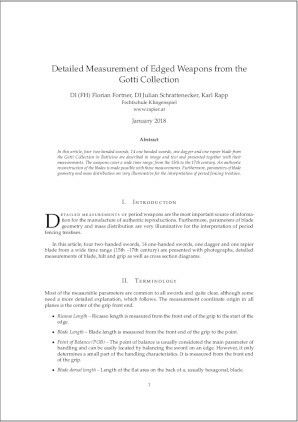 These measurements clearly show, that on average, historical originals are longer, heavier and exhibit a stronger ricasso and forte than modern weapons, which strongly influences handling and therefore the possible style of fencing.